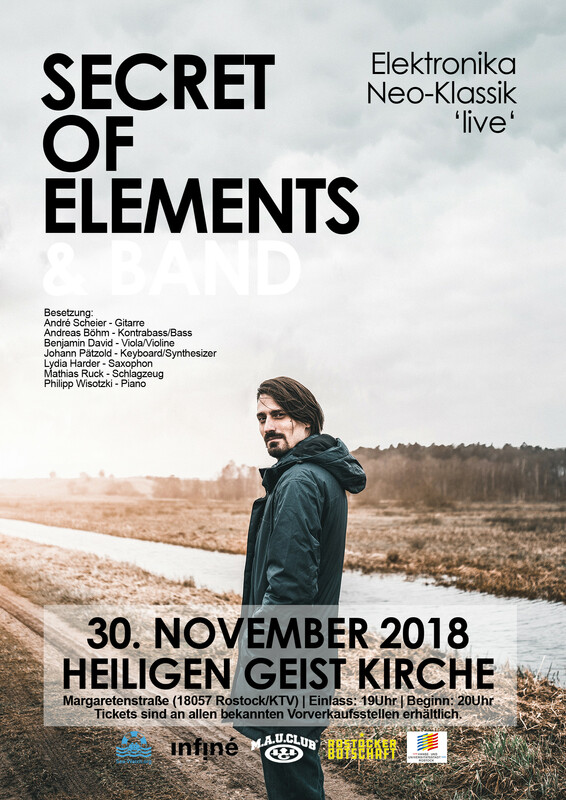 On November 30th, Johann Paetzold will perform as Secret of Elements live for the first time, accompanied by nine musicians on Rostock´s Heiligen Geist Church’s stage The pieces from his two EPs released by InFiné will be enhanced live by an organ, a double bass, a guitar, or voice; reinventing their cinematic spectrum by injecting a new energy at the boarders where rock, jazz and classical music genres meet. Check out his interview behind the stage. For every tickets sold there will be 4€ donated to Sea-Watch, to help further their work on and for sea rescue in the Mediterranean. - How long have you been working on this live show project? Putting my music live on stage has given me a lot of headaches over the past 3 years. This is definitely because I have stayed too long only writing music for image/film and theatre, but have hardly given a thought to how to put it on stage. I have created my own dilemma, a personal luxury problem. On the one hand my music is particularly adapted to theatre and film, on the other hand, it looked (to me) very complex and almost impossible to perform it live alone. InFiné motivated me to work though this issue, resulting in the following problematic : How is it possible to reproduce my music live, in an authentic way, that is viable to tour for a realtively unknown artist, like myself? 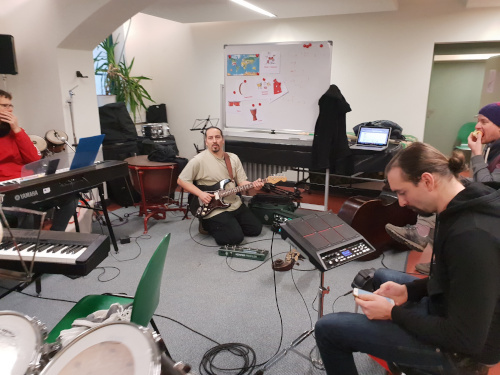 With the current line-up composed of musicians from Rostock + myself, I have finally found a flexible solution, that can be reshuffled in various setups. - Learning to work with musicians from different backgrounds can be a great challenge. Do you feel like you're losing control of your songs? I am working with a serious cast of professional musicians on the current show. From the beginning, I wanted to give them freedom -more than they usually have or take. In studio, I produce orchestral soundtracks. Live, it sounds -thanks to the band- more like post-rock. Instead of losing control, I would prefer to say that my music has gained a new dimension. - You've already worked to create the music for theatre and dance groups - now you are the the maestro of your own group - what is the differences between your previous experiences to compose, and your current work as conductor of/with your musicians? It's a little different this time. I don't take orders from a director, instead I have to lead a band. I feel uncomfortable as a "boss." It's hard for me to share criticism when I don't like something. It's easier for me to praise what I like. However, personally, when I have to write music for someone, I tend to find criticisms enriching. I usually work alone in studio, where I don't have to explain my ideas to anyone. But for the show, as a large band take and works with my music - I must voice my feelings, especially when I don't like something. Fortunately, I have help to translate my "film musician language" into "band language". - What can we expect when we discover the songs like "Odesea" and "Monumentum" on stage? Is there any song that this band process has allowed you to completely rediscovered? My music is louder on stage, a little more aggressive. It goes into the post-rock direction. The show will last over 2 hours, spanning from very quiet to very loud. There are tracks with up to 9 musicians on stage and sometimes very small cast of 1 to 3 musicians. In the rehearsals "The Effect of Butterfly Destiny" turned out to be a jewel. Whenever we rehearse this track, all band members have a big grin on their faces while playing, and it lasts over 15 minutes. - Part of the benefit will be donated to Sea Watch. What is your relationship with this association? Sea Watch was the first on the Mediterranean Sea, and should stay there. I have friends there. I myself was part of the sea rescue with Sea Eye. Without Sea Watch perhaps similar organisations would not have emerged. This shows that we have all learned from them, and they were always ready to teach and introduce new crews and organisations. I have the greatest respect for Sea Watch, and wanted to express that in supporting them.